A. Only on its right-hand side. Correct. The vehicle is being driven along the single-lane road and is not turning right, therefore you can only overtake it on the right. One of the most dangerous manoeuvres in a vehicle is overtaking another moving vehicle, so in this article we're going to cover the basic rules of overtaking, and then some advanced advice that you would get if you were training to be a police driver. Overtake only on the right unless you are passing a vehicle waiting or slowing to turn right, or there are marked lanes in which case you can overtake on the left if it's safe. The most important rule is that you must ensure there's nothing coming your way and that enough space for you to pull back in after you've finished your overtaking manoeuvre. This means you need to judge the available space, the power of your vehicle and whether it has enough acceleration in that space to get past, and whether there are any side streets where vehicles could pull out from. Remember that the faster that the vehicle you are overtaking is travelling, the longer it will take to overtake it. Check your mirrors, then signal for long enough to give other road users sufficient warning, check your blinds spots, then make the manoeuvre if it's safe to. Pull back in when you can see the other vehicle in your rear view mirror. Give way to traffic already in the lane you're moving into. If the road you are on has a speed limit of 80kph or more, or you've seen a keep left unless overtaking sign, you must drive in the left lane unless you're overtaking or want to turn right. If you can see that the dividing lines ahead are about to change to double unbroken lines. 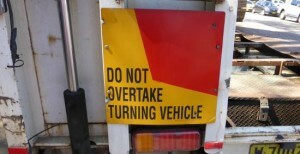 If you see this sign on the back of a long vehicle, it is likely to swing out to the right before turning left, so don't try to overtake it on the left hand side if it is indicating left or you risk being crushed by it. Remember that trucks have blind spots where it's difficult to see small vehicles immediately to the side of them. 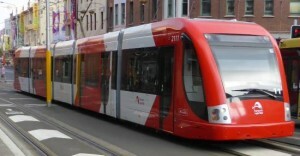 With a light rail vehicle you can overtake on the left if it is travelling in the centre or right hand side of the road, and on the right when it is on the left hand side of the road. Don't overtake a light rail vehicle in the direction it is signalling. Pay special attention also if you are travelling to Queensland and you encounter the cane railways where there could be heavy rail passing through town centres on the road. Bridges also sometimes have restrictions for overtaking because the road tends to narrow. 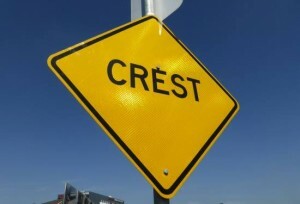 Pay particular attention to any signage and the lines painted on the bridge. If someone is overtaking you, keep to the left and let them overtake, and leave a space in front of you for them to pull back in. It's an offence to deliberately speed up to prevent someone from overtaking you. The risk of a death in a head on collision at 100kph is around 90%, so getting your overtaking moves right is critical. There are some guidelines that are given by advanced driving instructors that don't appear in the Road Users Handbook. The main hazard is the vehicle you are overtaking, and there are a number of secondary hazards such as the road surface, pedestrians, pets, glare from the sun, farm gates, laybys, hidden dips, standing water (which can cause blinding spray), etc. It's best to wait rather than overtake if you are not sure. It is also advised that you should start every overtaking manoeuvre with the possibility that you might have to abort the manoeuvre. It's better to do this than have a head on crash. However, if you have moved out from behind a vehicle to overtake, there's a possibility that a vehicle that was behind you could have closed the gap up to the vehicle you are overtaking, leaving you nowhere to go. You will need to judge each situation on its own merits. Overtaking is a compromise of safety. It's safest to follow another vehicle at least two seconds behind as this gives you more time to stop and you can see further ahead. However, this also means that when you go to overtake, you have to make up two seconds before you even get to the vehicle, and that means your overtaking manoeuvre takes long, exposing you to danger for a longer period. The overtaking position is closer to the vehicle in front, so you have to be more vigilant about the road and its hazards ahead. You will position your vehicle closer to the centre line so that you can see around it, but not so close as to be a danger to oncoming traffic. This also indicates to the driver of the vehicle in front that you are considering overtaking. If you follow too closely for too long it might pressure the other driver into speeding up slightly and that will make it more difficult for you to overtake. Advanced drivers avoid overtaking three abreast, for example if the vehicle you are overtaking is also overtaking a cyclist. This is because it reduces the margin of error for everyone involved. Take particular care around cyclists, especially children as they can be erratic. Many cyclists wear earphones and won't be able to hear the traffic. They also have a small tyre contact patch (therefore limited braking ability), are unstable and often the riders have not done any training in riding safety and might only be wearing a helmet as protective gear. Allow them space to move, and don't cut back in on them or turn across their path. Speed, or the sound of a horn can startle horses. Motorcyclists should be given plenty of room when you are overtaking, particularly if you are driving a heavy vehicle because your slipstream can destabilise them. This also applies when there are strong crosswinds. If you overtake a motorcyclist, thus shielding him from the crosswinds temporarily, as you pass, the winds could affect the rider's course; or, your vehicle could be blown into the path of the motorcyclist. Be careful in this situation. Take extra care if you are the one overtaking a long vehicle. As well as it being extra distance to travel, you could be affected by its slipstream. Long vehicles, vehicles carrying wide trailers, and agricultural vehicles often have blind spots that mean they won't be able to see you if you are close up behind them. Before moving out, look well ahead for any road signs that might indicate there's a side road that other vehicles could pull out of. In rural areas these are often given away by a lone street light. Before moving out, check that vehicles following you haven't started to overtake. To an extent, if you are clear in your intentions about overtaking, this is less likely to happen, but you must still check. Motorcyclists are more likely to do this as they usually have the power and acceleration to get past in shorter gaps. You need to become familiar with the acceleration capabilities of your vehicle so that you can anticipate how much room you will need. Bear in mind that on an uphill stretch, you might need much further to accelerate, especially if your vehicle is loaded with passengers and luggage. A line of traffic is the most difficult obstacle to overtake. It takes more time and you have to assume that other drivers in the line haven't seen you start to overtake and may pull out in front of you. Also, drivers behind you may start to overtake even though you are ready to overtake. One scenario that can happen when you are following two or more vehicles is that each successive vehicle is in the overtaking position and closer and closer to the centre line which puts them at risk from oncoming traffic. Unless you are ready to overtake, hang back a little. Once you are ready to overtake a line of traffic you need to spot where you can move back into the line if you will not be able to take the whole line in one manoeuvre. Even if you think you can overtake the whole line, a situation could unfurl where you have to move back into the line therefore you should always consider it a series of smaller manoeuvres that could possibly be taken as one whole one. Be aware that drivers can inadvertently close gaps. If you get to your first gap and its still safe to proceed overtaking, then look for your next gap and continue overtaking. Take care if you are coming to the end of a passing lane and two lanes merge into one. Overtaking on bends carries more risk as it requires that you can see through the corner and clearly tell that there is no traffic coming. Be aware of blind spots created by the vehicle in front. However, the exit of a bend is often a good place to overtake a heavy vehicle because it may have slowed down to take the bend and won't be able to accelerate fast out of it. You can use the corner to move into the overtaking position, and as the corner straightens and you can see the road ahead, make use of the lower speed plus your momentum to get by the vehicle. Be aware that if you are following a car, they may also be accelerating out of the bend which can cause a longer overtaking manoeuvre. If you are following a large vehicle, they can obscure your view of side streets on the left. As you go to overtake the vehicle, a vehicle can pull out from the side street into your path. Similarly a side street on the right with limited visibility of what is approaching can be dangerous. Occasionally motorists don't expect that a vehicle will be overtaking and can pull out into your path without looking. You can help other drivers overtake you by slowing slightly as they overtake, and not speeding up on passing lanes (this is particularly infuriating for other drivers). In terms of speed, overtaking versus the road rules is a compromise. The safest overtaking move should, in theory, be done as quickly as possible. However, road authorities cannot allow vehicles to exceed the speed limit for any reason as this creates problems. For example, if vehicles were allowed to travel at up to 140kph for overtaking it could be argued that this is not as safe (faster speed equals more likelihood of having a serious accident), and also how do you define for how long you are allowed to exceed the speed limit. It would create difficulties for law enforcement and (possibly) the courts. We like to think that the police would look leniently upon drivers who are exceeding the speed limit marginally while overtaking because it's about balancing risk. If all other conditions are perfect, are the reasons for not travelling at, say, 115kph, better than the reasons for travelling at 115kph while overtaking? Not all police will be lenient and the Road Users Handbook is very clear: you must not exceed the speed limit while overtaking.